Two quick business trips this month took me to the cities of Hyderabad, Bangalore & Chennai. Given how much news the new airports in Bangalore and Hyderabad have recently generated in India, I was looking forward to checking them out first-hand. For the Hyderabad trip, I had to stay in Mumbai overnight so I could take an early morning flight from there. 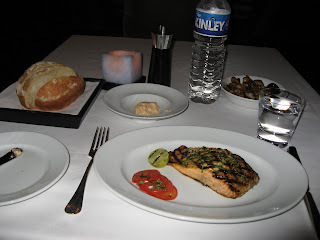 I drove into the Grand Hyatt late in the evening from Pune and headed straight for dinner. Note: Bangalore Airport photo credit: Soumik Kar. The M is the Grand Hyatt's principal Western restaurant, and offers a grill, martini bar and a wine library. You have to walk down a flight of stairs from the upper lobby to enter the main sitting area. Contemporary and airy with geometric patterns, this restaurant has an open kitchen and a large bar. 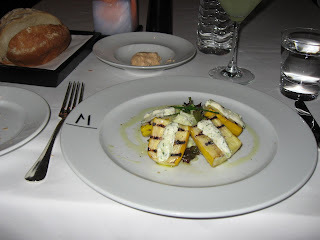 I ordered a starter of grilled zucchini with goat cheese as I awaited my martini. Incidentally, M offers almost 40 different varieties - from the sinful mint-chocolate martini to a variety of fresh fruit-based martinis! My entree was a grilled sea bass with garlic butter. 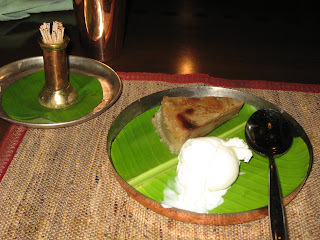 A baked apple pie with ice-cream to soothe my sweet-tooth and I was off to bed for my early morning flight to Hyderabad. 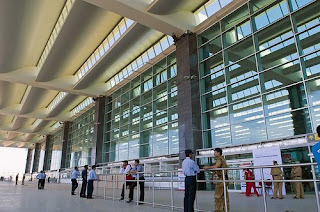 The Jet Airways flight to Hyderabad landed on time at the spanking new Rajiv Gandhi airport. I noticed an ample amount of space that will make further expansion in the future easy. There is enough space for newer extensions to the main airport building and lots of parking. The airport is a huge improvement our our older ones. While flying back, I also found I could check-in bags without needing to first scan them manually at an x-ray machine like is common at every other Indian airport. It was also good to see a bookshop, coffee shop and fast food restaurants after the security checks and within the departure area. 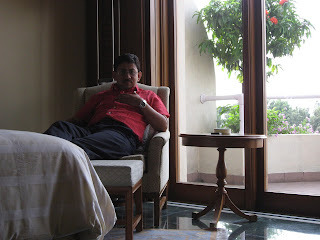 At Hyderabad, I spent the entire day in meetings with the press at the Coffee Shop of the Taj Krishna. I had been here ages ago and still carry memories of the aromatic biryanis I ate daily in downtown Hyderabad. No luck this time since I had to rush straight back to the airport to catch the evening flight back. Bangalore airport too looked well-planned and seemed to have space for future expansion. While people say the airport building and infrastructure are just enough to sustain today's passenger volume, it didn't look too crowded to me. Again, here too, the Departure area has quite a few shops and restaurants after the security checks which is a relief. The airport looks and feels similar to the one in Hyderabad. Actually, if at all there is at all anything negative to these gleaming new airports, it is the fact that they lack character and look the same. People have been complaining about the one-hour drive from the airport to the downtown areas. I can't see why that is such a big deal. Most cities abroad have their airports outside the city limits too; it is a good 40 minute drive from Houston International to downtown (and that on American roads which are much faster). The road from Bangalore airport was wide, multi-laned and traffic moved fast until we hit the downtown areas which were - as usual - crowded. I stayed at the Oberoi in the heart of downtown Bangalore. My work got done by lunch and I had the rest of the day to myself. 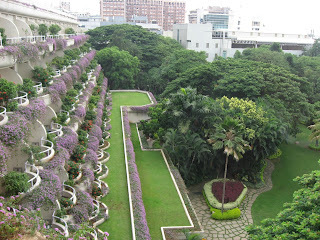 The Oberoi is an oasis of tranquility with its large gardens, trees and balconies filled with violet flowers. 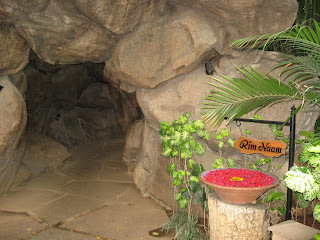 I walked into the Rim Naam Thai restaurant set in the gardens and surrounded by a water body. The food they serve is excellent too! The recently renovated Oberoi Spa is run by Thailand's famed Banyan Tree. 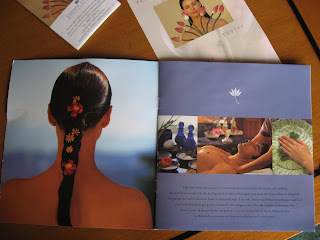 The 60 minute Oberoi Massage is a must for anyone who has the time to spare. On a colleague's recommendation I walked out of my hotel for dinner. The Karavalli restaurant in Taj's Gateway Hotel on Residency Road is a brisk 20-minute walk from the hotel. There was a cool wind blowing which made the walk pleasurable in spite of the traffic and the construction of Namma Metro (Our Metro in Kannada). Karavalli serves cuisine from the Malabar Coast that straddles Kerala, Mangalore and Goa. Since I was alone and yet wanted to sample their popular dishes, the waiter offered to bring me small portions of three starters and two curries. 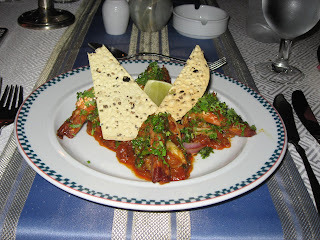 The Prawns Sukha Karwari was deep-fried, crunchy prawns tossed with a fiery red masala. 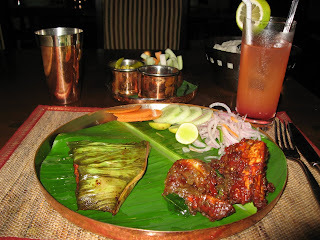 The Karimeen Pattichatthu, their signature dish, is made from fresh fish caught in Kerala. I also learnt some interesting details on how this fish is caught. Apparently women pile their hair on top of their heads and submerge themselves to sieze the fish by their tail. Men, on the other hand, hold a lamp and a butterfly net to snare the fish attracted to the light. The Karimeen Pattichatthu is a shallow-fried dish flavored with exotic Kerala spices. The other dish I remember is the Meen Polichatthu, a fresh black pomfret, marinated in Malabar masala, and wrapped in a banana leaf before being pan-fried to perfection. Every dish seemed to be hotter than the previous one. I was quite sure I will soon have smoke coming out of my ears! The Kozhi Malliperlan, is a delicacy from Kerala made with succulent boneless pieces of chicken with vegetables, coconut milk and fresh spices. The Karavalli Mutton Curry, another signature dish, same in a dark red gravy done in South Canara style. In Mangalorean villages, the tradition of cooking over open firewood stoves in clay pots continues. They usually cook oily fish in a blend of spicy masala to enhance the taste, while regular, fresh-water fish is cooked in a coconut-based masala. 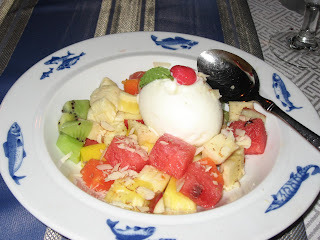 After all that hot, spicy food, it was nice and refreshing to nibble on Bebinca with Coconut Ice-cream at the end. Bebinca is made of many layers, each of which is partially cooked before the next layer is applied. This is probably the most popular dessert in Goa. After a day in Bangalore, I was back at the Le Royal Meridien in Chennai. I had a busy day here; other than for a quick lunch at Kumarakom, I had very little time to myself during the day. 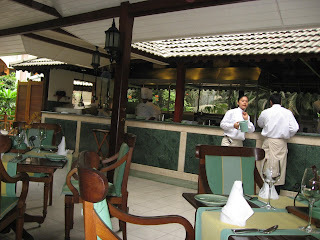 It was late when I returned and I decided to try the Kayal, the sea-food restaurant before retiring. I ordered their signature Coriander Prawns and ended with a fruit-salad. 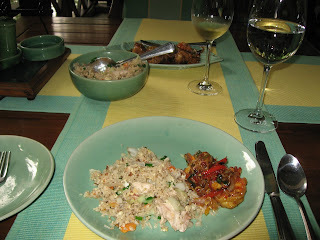 While the ambiance in the restaurant was good, the food was just ok. Nothing to write about. 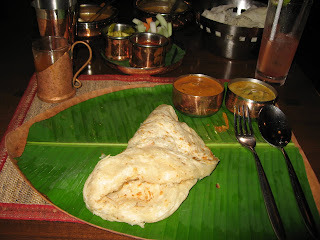 However, do try the Karavalli if you are in Bangalore (and you can handle really hot food!). wow! ncie to meet a fella foodie who can write so well too.. i write restaurant reviews at chennai.burrp.com .. i guess u l bb interetsed in readin/writing reviews too .. n hey ur welcome to chek my blog too :) happy blogging! woah nice! south india is so deja vu for me... u know, malaysia has a lot of tamils... and we've got punjabs too (which are known as sikhs or 'benggali' to us here)! and oh btw, i just realise that i've linked u in my blogroll since god knows when! Grilled sea bass would be my first choice too - then again you know as a Norwegian, I love seafood. 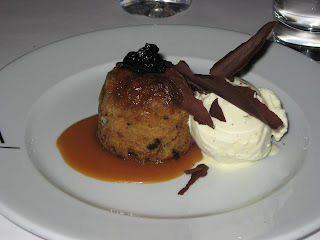 What a great story with great pics and treat - my mouth is watering - thanks for sharing! @sanmerci: Thanks! And welcome to my blog. @kyh: I realized that when I visited Singapore too. India, in that part of the world, usually means South India. @rennyba: I seem to have acquired a taste for sea bass too. You travel in obvious style, and your descriptions and photos of all of that delectable, beautifully presented food make me salivate. U my dear friend are enjoying the fine life. The banglore airport looks stunning. I wish they would make our international airport look as gr8. Though they are working on it, but i doubt they could make the facade look so pretty. @kajal: The problem with Bombay airports is they have to remodel the current one even while the daily hordes fly in and out. I expect the new airport (which will come up in Navi Mumbai) to be much better. @zhu: It's getting increasing easy to get a spa massage, even when travelling. Most large airports in Asia now have one, even if they are not as fancy as the resort ones. Good to read your views on the Hyderabad and Bangalore airports. It was high time that Bangalore had a new airport, and truly no big deal about the distance.